We speak from experience when we say that the benefits of #dryjanuary and clean eating can easily go down the drain after just a week of Lunar New Year festivities. After all, the countless pineapple tarts, steamboat feasts, and sugary cocktails aren’t exactly the best alternative to the salad bowls you would otherwise eat. If you’re sitting in a slump on your couch right now, ready to toss your 2019 resolutions into the bin, we’re here to help. Contrary to popular belief, fat-blasting doesn’t have to be a painful trip to the gym, nor does it have to take up a chunk of your precious break. As Sue Henris, fitness coach at Gravity Club demonstrates, all it takes is half an hour at home to give your metabolism a much-needed rev, effectively torching those calories you’ve so unreservedly accumulated over the past week. The club, located conveniently in the heart of Singapore’s Central Business District, is a wellness haven for individuals looking to work, workout, dine or simply recharge. Now roll out that mat and get ready for a good sweat. Stand with your feet shoulder-width apart. Start by doing a regular squat, then engage your core and jump explosively. When you land, lower your back into the squat position to complete one rep.
Land as quietly as possible, which requires control. Do two to three sets of 10 reps.
Place your feet and hands on the ground with each pair being slightly more than shoulder-width apart. If lying down, your hands should be positioned slightly in front of your hips. Raise your hips so they point sharply to the ceiling. Lower your chest to the ground by bending your elbows while keeping your legs straight. Slide your chest forward and up as you lower your hips to the ground. The movement should create a scooping arc with your upper body and end with your head pointed up to the ceiling. Lift up your hips and shift them back to the starting position to complete your first Hindu push-up. Try to work up to 10 reps in total at the beginning. Start by standing with your feet shoulder-width apart, with knees and hips slightly bent so you maintain a forward posture. Shift your weight towards your right, pick up your right foot, and push off from your left foot to move your body to the right. Go as quickly as you can during this movement while maintaining your form. At the third shuffle to the right, lift your left elbow and rotate your trunk, punching to your right as you do so. Propel yourself to the left with the same techniques. 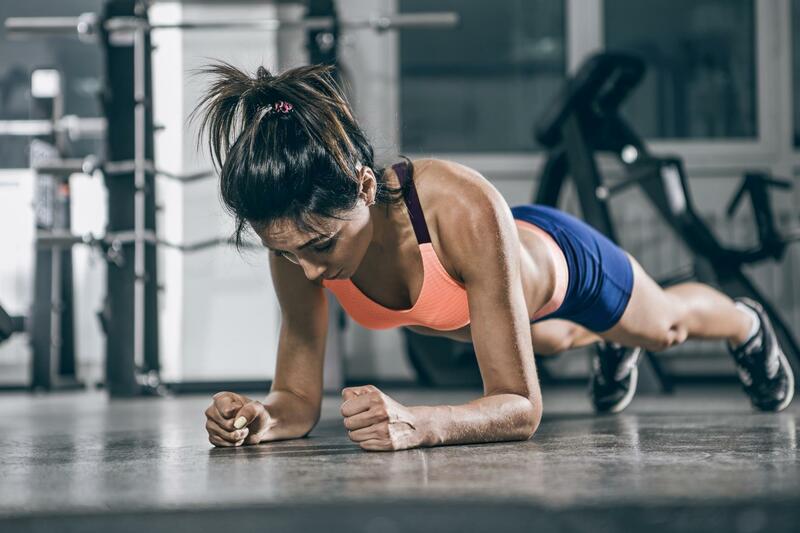 Start in a plank position with arms and legs long. Keep your abs pulled in and your body straight. Squeeze your glutes, and pull your shoulders away from your ears. Pull your right knee into your chest, pulling your abs even tighter as you do so to ensure your body doesn’t deviate from the planking position. Pull the left knee in quickly with the same form while pushing your right leg back and repeating the motion until you arrive at a “running” motion. Always be constantly aware of your body position — keep a straight line in your spine and never let your head droop. Start on all fours, shoulders over wrists. Tuck your toes and lift your body so your knees are hovering a few inches off the ground. Twist hips to the right and kick left leg underneath you and to the right as you lift your right arm off the ground. Return to the hover position and repeat on the other side. Lie on your back on a gym mat with your legs extended and your arms alongside your hips, palm down. Lift your legs four to six inches off the floor while pressing your lower back into the mat. Keep your legs straight as you rhythmically raise one leg higher, then switch, moving in a fluttering up and down motion. Perform your 15 to 20 repetitions, or 30 seconds straight. To vary the move, cross legs over and under each other instead of up and down.